GCG Asia Review – is guardiancapitalag.asia scam or good forex broker? Beware! GCG Asia is an offshore broker! Your investment may be at risk. GCG Asia is a Forex brokerage supposedly based in Switzerland. It provides clients with the MT4 trading terminal and a generous leverage of up to 1:100. However, the selection of financial products is quite poor and we couldn’t see a spread on EUR/USD through a demo account. The required minimum deposit is also not stated. According to the website the company behind the brokerage is registered in Switzerland by the name Guardian Capital AG. Switzerland is deeply integrated within the EU without being a member-state through a series of bilateral treaties. Online Forex trading has been taken into consideration in the country’s legislation and the Swiss Financial Market Supervisory Authority FINMA is in charge of overseeing financial activities. Forex brokerages in Switzerland have to be licensed by the FINMA but we find no mention of such a license on the broker’s website. 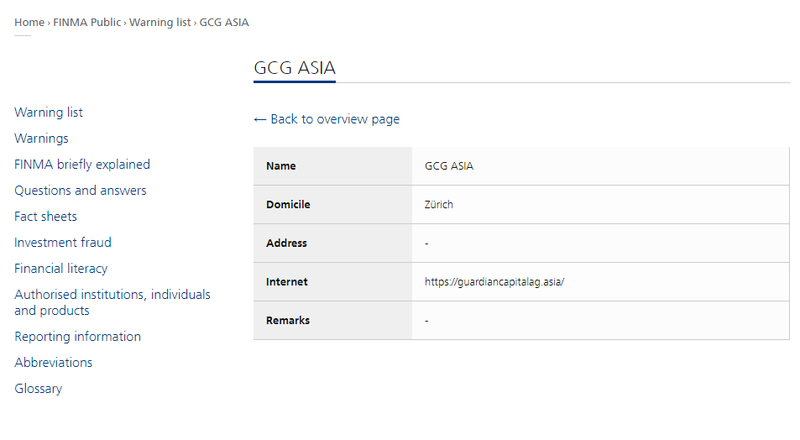 Furthermore, after checking the online registry of the Swiss authorities we can safely conclude that GCG Asia does not fall under any regulatory oversight whatsoever. As was stated above, the brokerage provides the MetaTrader 4 platform which is the widely preferred choice of traders at the moment. There is a test-drive available and we could see a spread of just 0.1 pip which is exceptionally low, especially compared to the industry average of a pip and a half. This inclines us to suspect that it may not correspond to the real time spread. Furthermore, clients are extended a leverage of 11200 which is also extremely high but yet another sign that we have an unregulated brokerage on our hands since there is a leverage cap of 1:30 throughout Europe. Furthermore, while researching the brokerage we came upon an official warning issued against it. GCGAsia has been blacklisted by the Swiss financial regulator. This is perhaps the most clear-cut sign of trouble. With no regulatory oversight we can’t be certain about the company behind the operation and whether it will fulfill its obligation towards clients. Regardless of this, being blacklisted in Forex trading is a major warning sign and we must state that potential clients of the brokerage may be open to substantial risk. We couldn’t find any information on the website regarding the available payment methods which is quite a worrisome sign. We could not find any explicitly stated withdrawal fees, however, we should highlight that many scammers choose not to disclose such information to would-be clients. Without proper information on the website we cannot be certain whether clients won’t be charged with any unexpected withdrawal or deposit fees once they invest. Having in mind all that was stated above, we advise traders to always put up only the required minimum deposit, instead of risking a bigger amount with no certainty. Afterwards, they may also try to withdraw a small amount in order to check for any unexpected fees or delays. Such fees and delays are usually the signs of a scammer.